The Family Ledger Report itemizes all of the family’s transactions based on a date range entered. *You can use this report to send a collection of invoice charges and payments as a single email statement for a family or a student. Enter the date range you want to see invoices for. The start date will allow paid invoices to show with their payments as of that date. If you want to see only open invoices enter tomorrow’s date as the start date. The end date will determine invoices shown up to that due date. So if you want to only show invoices due to the end of the month enter that date. If an invoice is open and due prior to the start date it will still be reflected on the report. 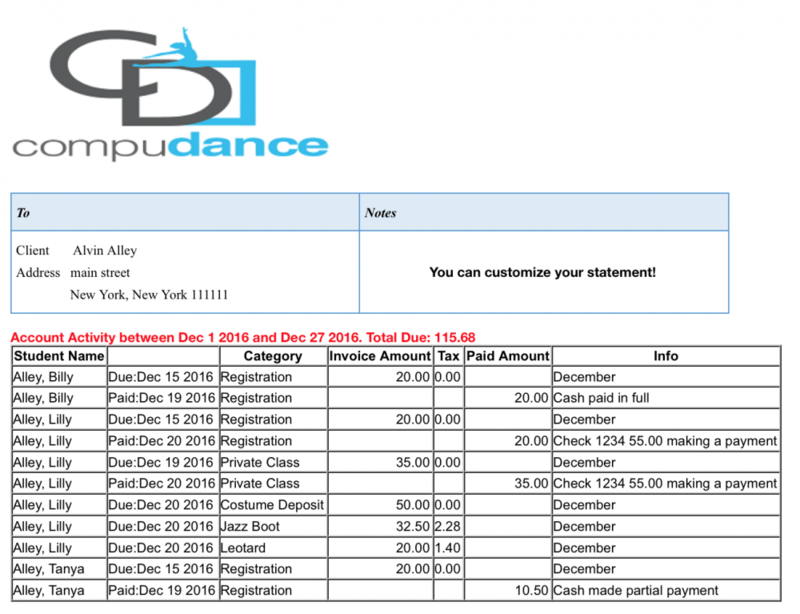 The list will show all invoice and payment details for the studio. You may filter for a specific family, student, income category. !Do not expand the groupings. If you do, each line shown will become a statement email and your families will receive multiple copies. A popup box will appear telling you to group and not open the groups. Click OK. The studio email address will get a copy of each statement sent. See Sample Below. Note the Payment Notes are shown in the last column (Info) after the type of payment. In the below example the 2nd line “paid in full” and last line “made partial payment” were written in the note fields when processed.